When I'm running again I'll have to have a ferret about and see if I can find any clinkers. When I was ordering the grate from Blackgates I saw they also stocked the Southworth vertical steam pumps. One of these has been on my project bucket list for a while. I went for the 3" because the 6" would be too large for a loco this size. If it was too small it could always go on the Rob Roy. Anyway for 28quid it wasn't going to break the bank. http://madmodder.net/index.php/topic,4763.0.html there wasn't much point in doing another one. But I have added a few points to Stews thread to help others. I had identified some drawing errors and found Bob Potter, who is now the proprietor of Southworth, is a member of this forum so I've been in touch with him. The 3" pump does seem a tad small for a 5" gauge loco so I was toying with the idea of making a scaled down version of the 6" pump. I had it running on air this evening with water in the tanks it was capably filling the sight glass. With the boiler full and the regulator shut and the pump ticking over I got it to a hydraulic pressure of 30psi. It would have done more if I'd let it. With a single acting pump and about a 2cc displacement it not going to get me out of trouble. But with the hand pump, axle pump and injector it's only there for show topping up when stationary for long periods. 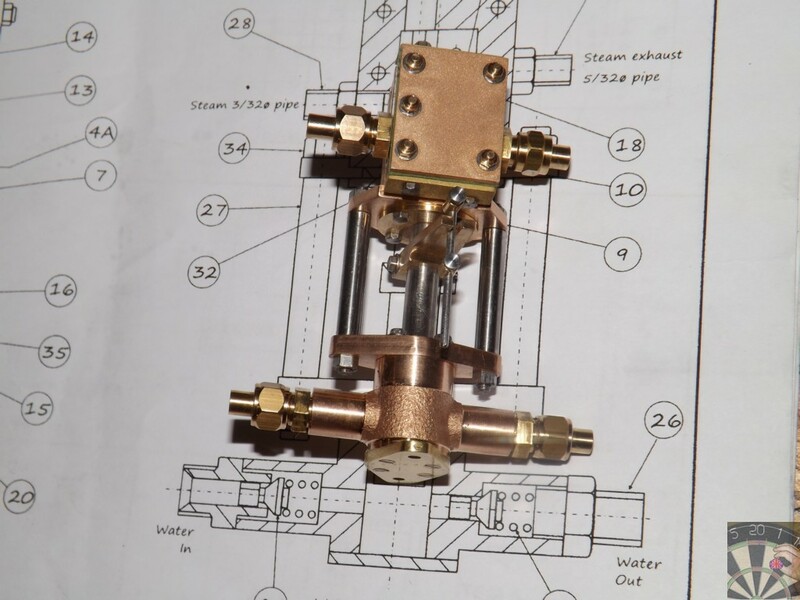 If you want to try your hand a clock making this pump has enough little parts to make it an interesting build. I thoroughly enjoyed doing it. That looks good pete and sounds promising. I've always liked the idea of these but have never seen one in action at least not in our club. Hopefully I'll get a chance to try it this weekend and get a video. I've seen locos with Westinghouse pumps and the gentle pumping action and the hiss of steam every stroke is quite mesmerising. Hopefully this Weir pump will be similar. Apparently Weir pumps do have a tendency to short stroke. This one only seems to do it if too much oil is applied through the airline. I think it must affect the way the shuttle functions. 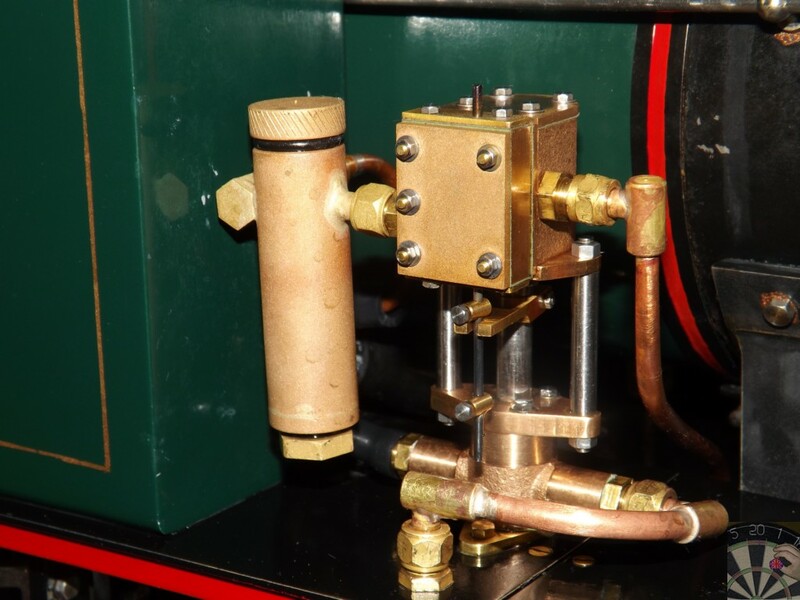 Lets hope it will be a bit different on steam and the displacement lubricator. 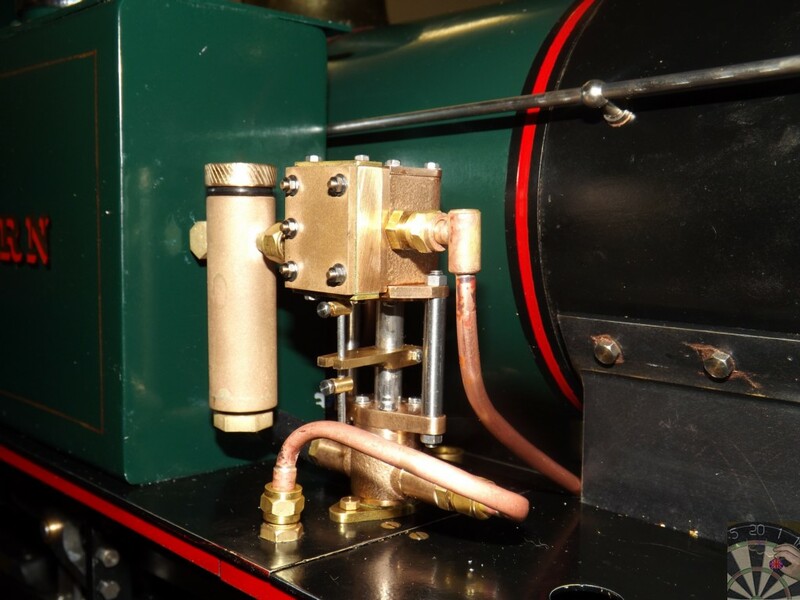 I had another play tonight doing a hydraulic test and with 30psi air pressure into the pump and the pump ticking over I had it holding the boiler at 90psi water pressure with one of the safety's just weeping. The principle reason for the test was to take the opportunity to check for any minor leaks in the pipework disturbed after having the boiler out. Having the pump running like that saves constantly tending the hand pump to maintain the pressure when doing the test as even a pretty small leak will dump the pressure pretty quickly. I can imagine them being quite nice to watch. Sounds like it's performing well then. Well the lack of an update means that the track test last week wasn't that sucessfull. the thing would just stop for no reason and vent straight to the exhaust. I spent a bit of time this week tracking down the problem to the valve lifting and remedying the problem. I've posted the details on Stews old thread to keep the information together for others. Just bookmarking this so I can find it again ! Bad Behavior has blocked 16540 access attempts in the last 7 days. Page created in 0.151 seconds with 21 queries.